The big question: Are Texas non compete agreements enforceable? 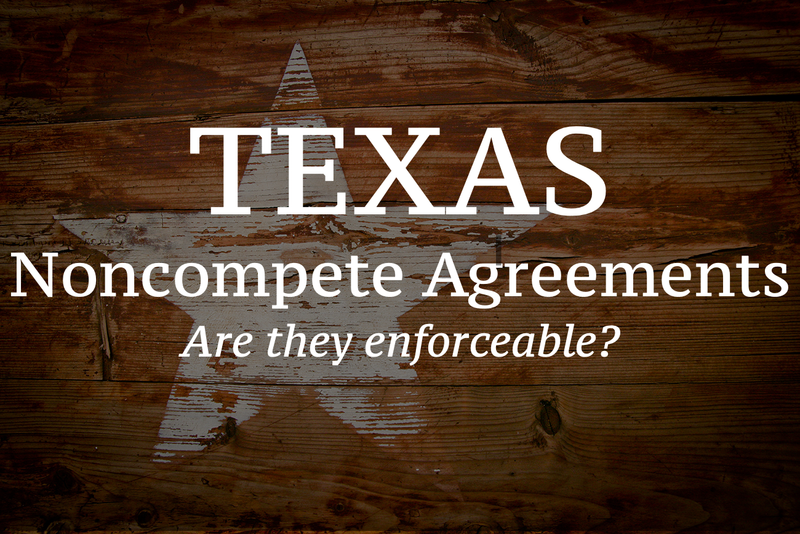 Many assume that Texas noncompete agreements are less enforceable than they really are. The short answer is, yes, they are. Since 2006, Texas has gone from being a very anti-noncompete-agreement state to a relatively pro-enforcement state. Furthermore, for Texas noncompete covenants to be enforceable, they generally must be reasonable in scope in terms of time, activities to be restrained, and geography. Below we’ll look at three Texas Supreme Court rulings which made noncompete agreements more enforceable. Back in October 2006 the Texas Supreme Court clarified what it takes to make a non-compete covenant enforceable with it’s judgement in Alex Sheshunoff Mgmt. Servs., L.P. v. Johnson, et al.. In doing so, the court resurrected many agreements that were previously thought to be unenforceable. For years, Texas courts held that, with respect to non-compete agreements, a promise dependent upon continued at-will employment is no promise at all. Such a promise was “illusory,” the courts held. Thus, a promise to give an at-will employee a raise, a promotion, stock options, or confidential information was “illusory,” unless whatever was promised was delivered at the precise moment that the employee signed the agreement (otherwise, the employer could terminate the employee before fulfilling its promise). In the Sheshunoff Case, the court held that even in the case of an at-will employee, a gap between the employee’s signing the agreement and his receipt of the confidential information will not render the agreement unenforceable. The moment the employee gets the confidential information–whether it occurs four hours, four weeks, or four months after he signs the agreement–the non-compete agreement becomes effective. The court thus clarified the law, in a much needed way, and non-compete agreements became relatively more enforceable. From this point forward, a delay between the employee signing the agreement and getting the information was no longer a fatal blow to the enforcement of a Texas noncompete covenant. After the court’s opinion in the Sheshunoff case, it was an open question whether, to be enforceable, a Texas noncompete agreement must contain an explicit promise by the employer to provide confidential information to the employee. In Mann Frankfort Stein & Lipp Advisors, Inc. v. Fielding, 52 Tex. Sup. J. 616 (Tex. April 17, 2009), the court answered this question, and held that the employer’s promise to do so can sometimes be implied. In Mann, the court held that even if the noncompete agreement does not contain an explicit promise by the employer to provide confidential information, if the employee’s job will reasonably require the employer to do so, then an implied promise to provide confidential information exists. This implied promise will provide the consideration necessary to make the noncompete agreement enforceable. This was an important holding, obviously, because it meant that some noncompete agreements that were previously thought to be unenforceable, now arguably were. The employee bound by the non-compete agreement was still able to challenge whether the information given to him was truly confidential, and he could also contend that the scope of the restriction is unreasonable. Nevertheless, the combined effect of Sheshunoff and Mann suggested that the supreme court may be tiring of “technical” arguments over the enforceability of noncompete agreements. Rather than constantly focusing on the precise wording of the agreements, and on when the information which arguably justifies the restrictions was conveyed to the employee, the court was signaling a desire to focus on what it considers to be the true substantive considerations: whether confidential information was in fact conveyed and, if it was, whether the information justifies the restrictions contained in the agreement. For employers whose current or former employees were bound by noncompete agreements (particularly if the agreements were signed years ago), this ruling made enforceable some agreements that otherwise would be unenforceable. The main take away from the Marsh case was this: Covenants not to compete became far more enforceable in Texas than they were just a few years prior. As a result of the holding in Marsh USA, monetary compensation (at least in the form of company stock) could now be sufficient to support an employee’s noncompete obligations. This was a major change in Texas employment law. The Texas Supreme Court’s long-awaited opinion in the Marsh USA case was released on June 24, 2011. In the Sheshunoff case, the court eliminated arguments that employees had previously used to defeat covenants not to compete in Texas. By accepting the Marsh USA case for review, the Supreme Court suggested that it might further restrict anti-enforcement arguments. And indeed it did. Prior to Marsh USA, Texas courts had consistently held that in the employment context (as opposed to the sale of a business context), the only consideration that would justify a restrictive covenant was the employer’s providing of confidential information and specialized training. Texas appellate courts had held that an employer’s giving of money to an employee was insufficient to justify a noncompete agreement. Thus, giving an employee a signing bonus when he signed the no compete agreement, or having him sign the covenant in conjunction with receiving a promotion was not enough. Rather, to have an enforceable noncompete agreement, a Texas employer had to provide its employees with trade secrets, confidential information, or specialized training. The issue in Marsh USA was whether an employer who had given stock options to its employee could enforce a noncompete agreement against him. The Texas Supreme Court held in the affirmative. Both employers who have an interest in ensuring that their noncompete agreements are enforceable, and employees who want to protect their right to work should have their noncompete agreement reviewed by an attorney who has experience with these cases.